When your child begins elementary, middle or high school, there are many drastic changes, including the type of homework that's assigned. If your child is just starting at a new school and feeling nervous about what to expect from math class, help him or her prepare by following the suggestions below. In elementary school, your child will be assigned homework for the first time. Help him start his school career on the right foot by setting aside homework time each day. The key is to allocate enough time to get it done. If your child has trouble concentrating on the work, sit beside him and help when necessary. Typical math assignments will include both math drills and simple word problems. Middle school typically begins in sixth grade and comes with many new experiences, such as having a locker. Math homework assignments will likely be longer than your child is used to. Assignments at this level include real-world problems that deal with statistics and probability. 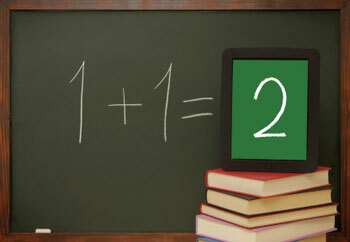 Students will also begin to study algebra and equations with one variable. In high school, most students take algebra, geometry, trigonometry and calculus. Most high school textbooks have practice problems with the answers included. If your daughter is entering high school, you may want to make sure that she's solving the problems before looking at the answer in the back of the book. 1. Tim has 13 pieces of pizza and ate seven pieces. How many does he have left? 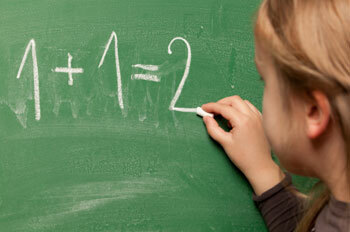 In early elementary school, students learn basic addition and subtraction facts. After eating seven pieces, Tim has six remaining. Visuals, like number lines and counters, can help if your child is struggling. 2. There are 12 racers in a bike race. How many wheels are there? Make sure to include word problems when practicing at home. With frequent practice, your child will become accustomed to word problems and, as a result, he or she will be more prepared when encountering them on standardized tests. For this problem, multiply 12 x 2 because there are two wheels on each bike. The total number of wheels is 24. 1. You flip a coin. What is the likelihood that the coin will land on heads? The probability that the coin will land on heads is 1/2. Pre-algebra problems generally include one variable. Begin by isolating the variable, x, by subtracting two from both sides so that the equation looks like this: 6x = 18. Then, divide both sides by six. The answer is x = 3. 1. 4x - 3y = 25. Solve for y. Advanced algebra problems include two variables. For this problem, isolate y by subtracting 4x from both sides so that -3y = 25 - 4x. Then, divide -3 from both sides. Finally, the answer is y = (25 - 4x)/ -3. 2. Find the coordinates where y = 2x + 1 and y = x + 2 intersect. For this problem, it'd be helpful to draw the two lines on a graph. The intercepting coordinate is (1, 3).